WASHINGTON (Sept. 22, 2010) -- Personal resilience and her conviction the Army would rescue her is what helped a former prisoner of war make it through the ordeal of captivity nearly two decades ago. Brig. Gen. Rhonda Cornum, now director of Comprehensive Soldier Fitness, was captured by Iraqi soldiers in February 1991 when the Black Hawk helicopter she served on as flight surgeon was downed during a search mission. Brig. Gen. Rhonda Cornum speaks before a Master Resilience Training course at Fort Meade, Md. "I approached that like other problems -- that I will make it as good as I can make it," she said. "Instead of just catastrophizing about that I had several broken bones ... I was grateful my fingers were still moving and still attached. I started to learn some of the language. I didn't know how long I was going to be there." The then-major had been captured with crash survivors Sgt. Troy Dunlap and Staff Sgt. Daniel Stamaris. She said during the entire time of their eight-day captivity, she maintained confidence in the U.S. military's dedication to its own. "I had gut confidence -- spiritual strength for me was important -- knowing that the Army was going to come get me," she said. "My new mission was to keep myself and the guys I was shot down with alive until they did. So confidence in something bigger than yourself is really part of what we think is important." Only during her initial capture, when the vehicle her captors transported her in came under a strafing attack, or when she was led to believe she'd be executed, did she doubt she'd make it out of the situation alive. "It's very difficult to think of something positive when somebody's got a handgun to the back of your head," she said. "The only positive thing I came up with at the time is, well, at least it won't hurt. And the gun went click and I'm not dead, so, I was grateful for that and went off to jail." It will be 20 years ago in February that Cornum was captured, and while some might think the event would still be fresh in the general's memory -- that it seems like yesterday -- she says that's not the case at all. "It hasn't felt like it was yesterday since 1991," she said. "It's an interesting thing. I think for some people, that's the last thing they ever saw of me. And I just kind of went back to work and did surgery. So for many people, when they look at me, it was like it was just yesterday, because they haven't seen anything that happened in the between time. For myself, that's not true." In the last 20 years, Cornum's gone from major to general officer, attended Air Command Staff College, served a five-year urology residency, served as commander of two Army hospitals, as surgeon for U.S. Army Forces Command, and attended the National War College. 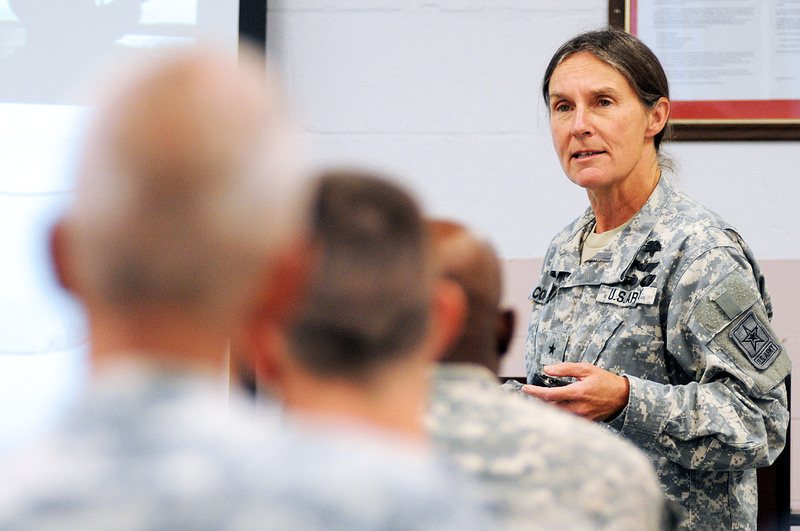 Today, she acts as director of the Army's Comprehensive Soldier Fitness program. The program has been fielded for over a year now, and Cornum said while most Soldiers have probably heard of it, they are probably not completely aware of what it is about. "It's a program for increasing psychological fitness and strength," she said. "It's modeled after the way we do physical training, so there's an assessment, there's reassessment as you move along, there's individual training." The program is also designed to teach Soldiers resilience. "It's the ability to bounce back after adverse events," Cornum said. "If you are a resilient person, you are more likely to be able to take advantage of opportunities because you know already that even if you are not successful the first time, you will bounce back and you will be able to be successful the next time." Resilience, and other skills taught today as part of the CSF program's master resilience training, are something Cornum said helped her get through her ordeal in Iraq. "I was convinced that how you go into a situation is really going to determine how you come out of it," she said. "I was very fortunate that I had those thinking skills and that strength before I went in." Cornum said she approaches problems, a cancer diagnosis or family issues the same way: "If I work hard enough, we are going to be successful at getting though this," she said. Not everybody starts off with those kinds of coping skills, she said. Some can be learned through background or educational experience. But, she said, Comprehensive Soldier Fitness is designed to help Soldiers learn to deal with difficult situations and not be destroyed by them. She said anybody can get better at dealing with difficult situations. "Wherever you are in the spectrum of psychological health ... CSF has something for you and you can get better," she said.